In this right facing, ¾ length hand-coloured ambrotype portrait, the unknown male subject is posed seated on a floral upholstered chair with one hand on his thigh, and his other arm resting on a small table covered in a similarly distinctive floral-patterned plush cloth – both the chair and the plush cloth are known studio props of the Sydney-based (American-trained) photographer Thomas Skelton Glaister. From April 1855 Glaister’s American and Australian Daguerreotype Gallery was located at 100 Pitt Street, and concentrated its studio portraiture on Sydney society’s elite. Although Glaister’s photographs were expensive, he offered hand-colouring for no extra charge and quickly garnered a reputation for high photographic standards. The sitter wears a well-tailored, three-piece ‘ditto’ suit of light-coloured tweed cloth comprising a single-breasted frock coat with long narrow, sleeves, a turn back collar and large self-covered buttons, fastened high at the base of the throat and then left open to reveal a matching single-breasted vest and pair of well-fitted trousers. He wears a fine white linen shirt with a stand collar and a pale blue silk neckcloth. A gold watch chain is draped across his torso from the pocket in which his watch has been placed, looped through a button hole at his waist and anchored with a T-bar in the shape of a [sword or rifle]. All outer garments for men were generally made of wool at this time and wrinkled easily without extraordinary care; the trouser press was not invented until the 1890s. Men were usually clean shaven in the 1850s, when soldiers returning from the battlefields of the Crimean War (1853-56) made beards acceptable in polite society; in the colonies miners, too, came back from the goldfields unshaven. Though hair length shortened through the decade, by the mid-1850s most respectable men were sporting long side burns or a fringe of beard around the cheeks and along the jawline. 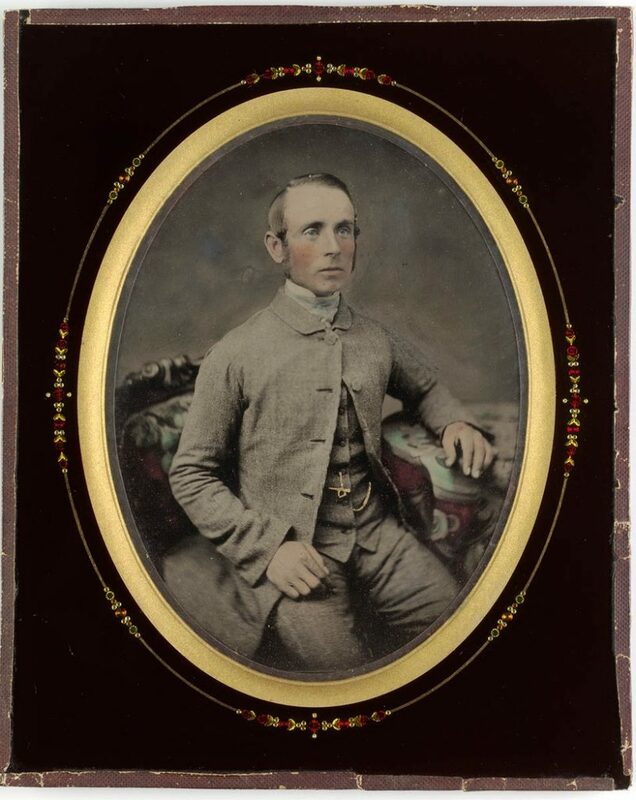 Thomas Glaister was the finest exponent of the ambrotype in Australia. In 1857 he advertised that his ambrotypes were twice the size of any other in Sydney and impervious to fading due to his exclusive enamelling process which, he claimed, not only fixed the colours but added a ‘brilliancy to the picture…having all the transparency of miniatures on ivory.’ SMH, 21 November 1857. PHOTOGRAPHER: Thomas Skelton Glaister (1825 – 1904) worked for the Meade Brother’s photographic studio in New York from about 1850 to 1854, when he arrived in Australia to work for Meade Brothers’ Melbourne branch, located at 5 Great Collins Street. Glaister moved from Melbourne to Sydney in April 1855, establishing his own studio which he called the American Australian Portrait Gallery. On Tuesday 4 Dec 1855, Thomas Glaister advertised on the front page of Sydney’s The Empire newspaper describing his ‘American and Australian Daguerreotype Gallery’, as having: splendid Photographic Rooms, with one of the best arranged and largest skylights in the colonies, at 100, Pitt-street, next door to the Royal Victoria Theatre, where he is now producing likenesses which are pronounced by good judges to be vastly superior in delineation, boldness, and the most lifelike to any ever before taken in this colony…Mr. G. has one of Haydon and Co.’s quick working cameras (the quickest now made), the only instrument of the kind in this country, by which pictures are taken in one fourth of the time required by other cameras… On 5 January 1856, the People’s Advocate reported: Having recently paid a visit to Mr. Glaister’s American and Australian Portrait Gallery, next door to the Victoria Theatre, we must pronounce it as the most complete and best arranged studio for taking likenesses in the photographic style, we have yet seen in Sydney… Glaister also provided advice for sitters on clothing that would reproduce well, including the suggestion that ’…For gentlemen gloves should always be omitted; [and] dark vests, scarfs or handkerchiefs are preferable…’ AMBROTYPE: By 1856 the daguerreotype had been superseded by a new wet-plate photographic process on glass known as the ‘ambrotype’ which quickly became the more fashionable process. Brought to Sydney in 1854 by James Freeman of Freeman Brothers, photographers in George Street, this special type of collodion process was faster than previous methods, with an exposure time less than 10 seconds, and produced a glass negative which, when placed against a dark background, created the optical illusion of a positive image without the reflective issues of the daguerreotype. It could also be coloured and was a quarter of the price. The ambrotype proved popular with the middle classes but, as with the daguerreotype, it was destined to be short-lived as copies could not be made. COLLODION: The collodion positive, or ambrotype, was made by coating glass plate with a viscous liquid known as ‘collodion’, made by dissolving guncotton in alcohol and ether which, after the chemicals in the emulsion evaporated, left a thin clear light-sensitive film on the plate. This process required photographers to coat, expose and develop their plates while still wet (hence the term ‘wet-plate’ photography) working quickly before the collodion dried and lost it light-sensitivity. Photographers were slow to realise that the collodion negative could also be used to produce multiple positive prints which, once they did, would change portraiture for ever.